I would love to introduce you to our new product developer and tester. 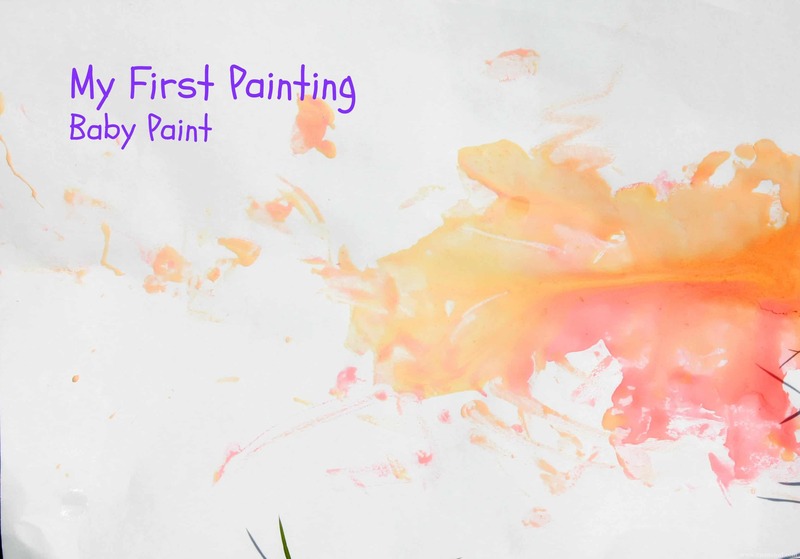 He will surely be working on fixing, finding and running and this is his first real experiment with his first painting! This is his first painting! Seriously fun and easy! Dylan is 6 months and we thought it appropriate in our lovely summer weather that we sit outside and create a little something together. I made baby paints – completely edible. Mix well. You may need to mix occasionally while painting as the corn flour can settle a little. I added the color in 2 ways: The orange I made by adding a tablespoon of Cool Aid and the red I made using the liquid from the beetroot we have in our fridge. To color this paint you could also use food coloring, other veggies that have a strong color (carrot juice would make great orange for example) or any edible juice syrup or granules that have a strong color. Hands may turn a little rainbow – but hey – it comes off! I was actually surprised at how long he sat and painted! This held his attention for a good 20 minutes! Then big sister Emma got involved – and that was even more fun! I eventually took away the paper and we just squished! Welcome to the team my boy!